Despite the film’s title, Atrocious (2010) is not bad or unpleasant at all. 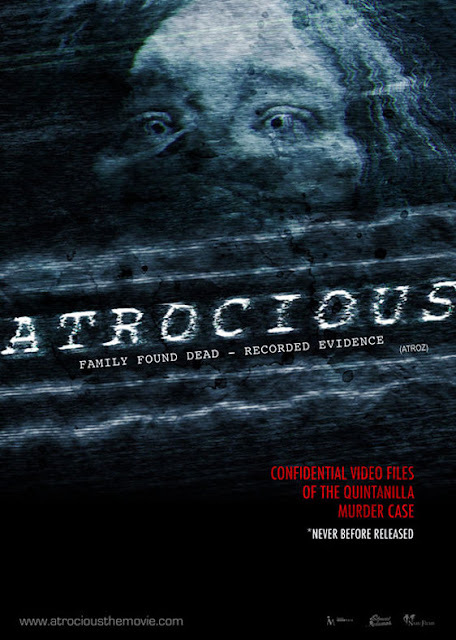 In fact, Atrocious is a well-made and effective horror film of the found footage variety. It succeeds in large part, however, because it cribs material from a different horror sub-genre: the Italian giallo. In films of this type -- ones made by filmmakers such as Dario Argento, for example -- there is often a strong mystery aspect featured in the narrative.Specifically, there is an ambiguity or misunderstanding, at least at first, on the part of the protagonist about the nature/identity of the violent killer. 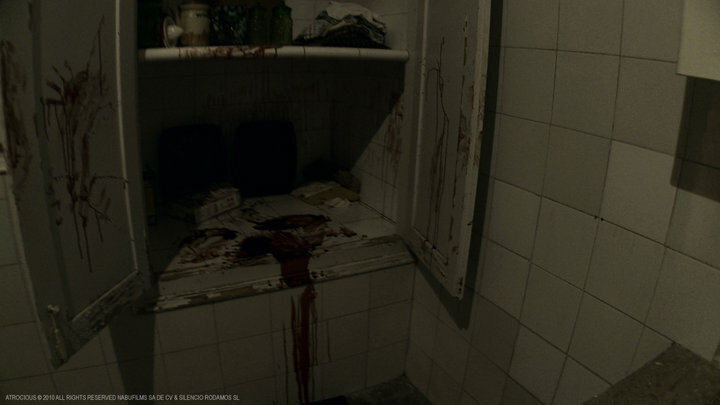 And the psychological motivation for that killer’s violence in the giallo format is inevitably revealed (in the denouement) as being connected to a past trauma suffered; often one of a sexual or family-of-origin nature. Atrocious conforms to both elements of the giallo paradigm. It hinges on a misunderstanding about the nature of the threat faced by the lead characters, and reveals the true villain as an individual psychologically damaged by a traumatic event years earlier. More importantly, the Spanish-made Atrocious, directed by Fernando Barreda Luna, thoroughly understands the giallo format and its story beats, and even, at one point, features a Dario Argento movie (or video cassette) on screen, to clue the viewer in to its creative roots. It's true that Atrocious play on a superficial level a bit like a shaggy dog story at first, a wild-goose chase or game of misdirection that all comes together, finally, in the last few frames of the film. It is only then, after the surprising finale (and act of brutal violence), that one can look back and contextualize the effort as being of or at least related to the giallo tradition. 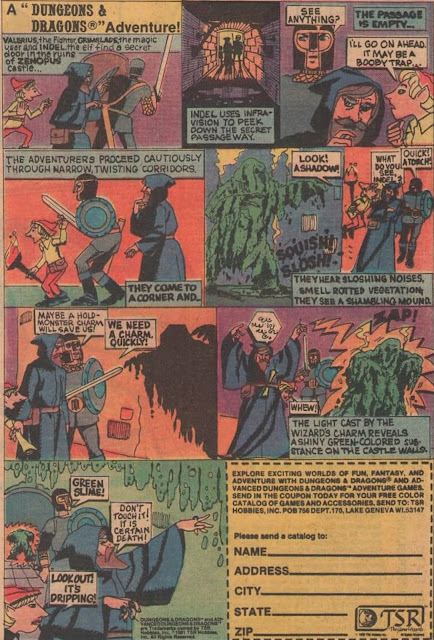 Like many found footage films, Atrocious also depends on the idea of characters getting lost, and here that trope plays out in a wooded maze that seems inspired, at least in part, by the finale of Stanley Kubrick’s The Shining (1980). That film involved a very bad parent figure, Jack Nicholson’s Jack Torrance, and Atrocious ultimately works towards the same end, though quite unexpectedly. Although some lost-in-the-wood passages in the film go on a stretch too long, and defy credibility since one character has actually marked a path out of the woods on statuary, Atrocious nonetheless demonstrates the elasticity of the found footage format. Sure, the film hits all the notes we all expect -- the title cards giving us the time stamp of recovered footage, the night vision sequences, and the lost-in-the-woods chestnut -- but the director's canny use of giallo elements and patient approach developing suspense makes Atrocious a worthwhile addition to a format that is so often discredited. Video footage found at the scene of a massacre in Sitges reveals the unusual story of young Cristian (Critian Valencia) and his sister, July (Clara Morelada). For the Easter holiday, they traveled with their mother, father, and brother, Jose, to a family house near the Garraf Park or Forest. They were excited to travel to that region because together Cristian and July produced a web-show about urban legends. In particular, they were intrigued by the story of Melinda, a girl who disappeared in the nearby woods in 1940. Some versions of the story claim she fell down a well and died there. Others claim she is not a ghost at all, but a devil trying to trick you. But the story is widely known as one parents tell their children so they don’t get lost in the woods at night. Once at the long uninhabited family house, Cristian and July explored the home, and found a VCR and several videotapes in the basement. Those tapes (of films like The Bird with the Crystal Plumage ) have not been touched in over a decade. Then, hoping to solve the mystery of Melinda, the siblings violated their father’s orders not to go into a wooded maze at night. Instead, they explored it, and came upon a well. Melinda's well? The next day, the family dog was discovered dead at the bottom of that well. Then, one night, Cristian and July’s mother ran to them in terror, claiming that her youngest child, Jose was missing. Cristian and July ran into the maze at night, hoping to find their little brother there, unaware that a different terror awaited them in the darkness. Like most found footage films, Atrocious is not long. It runs just about eighty minutes. And a significant portion of that running time is spent in the dark woods, in the maze near the Quintanilla house. Hansel and Gretel-style, Cristian and July attempt to find their way out of the labyrinth, and also locate their missing brother (and mother). These scenes are well-shot, and genuinely creepy, even though they go on for a long time. When one makes the connection, thematically and visually, to The Shining, one can see why so much time is spent in that dark, endless maze. My only concern is that it takes a long time for Cristian to seek out his “bread crumbs” -- orange markings he made in the maze -- so he can find his way out. If I got lost in that confusing labyrinth at night, that would be my first strategy: find the markings I left in daylight to work my way to freedom. Beyond that slight miscalculation in terms of pacing and plausibility Atrocious comes together surprisingly well the more one thinks about it. At one point, a character notes that “at night, it’s different,” referring to the maze and its terrifying, confusing landscape. The same observation is true, however, of a psychologically damaged character. There, the mental landscape is different at night, and just as terrifying. This character suffered a terrible incident in youth, and the audience is informed that the trauma resulting from that incident can recur not only in adulthood (as it does in the film), but at night as well. The night-time brings out ghost, but in this case, it's not the ghost the audience expects. My synopsis above mentioned The Bird with the Crystal Plumage, directed by Argento. That film concerns a killer whose descent into violence is spurred by the viewing of a painting. It also concerns a protagonist who thinks he sees one thing, but in fact, sees something else. It’s an appropriate choice of reference for Atrocious because this found-footage film involves a descent into madness caused by returning to a particular location, the house and maze, and revolves around a misunderstanding of the threat. Cristian and July believe they are investigating the supernatural “ghost” Melinda, but in fact are contending with an evil that is quite different. They see the results or handiwork of the killer’s violence -- a dog corpse at the bottom of a dry well, a body burned beyond recognition in the family hearth (another visual indicator that the killer’s trauma stems from family), and so on. They fear they are dealing with some kind of supernatural entity, but the horror is much closer to home than they recognize. On a surface level, it’s easy not to see much in the film. Two kids go on vacation, get lost in a maze, and get hunted down by something evil. But scratch that surface a bit, and contextualize Atrocious for its relationship to the giallo format, and films including The Bird with the Crystal Plumage and The Shining, and one can see how meticulously the narrative has been assembled. A lot of careful thought went into the details of the story so it would all line up at the end. I should add, as well, that the film’s last act is terrifying. By sheer luck, it seems, Cristian and July make it back to their house from the wooded maze. They get inside, are confronted with the corpse in the fireplace, and before they can ponder it, the power goes out. Then something comes for them. Relentlessly. 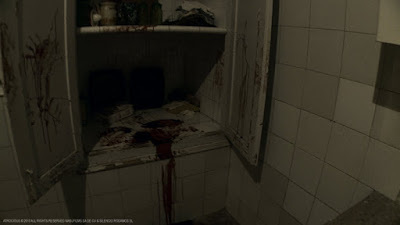 There are real moments of terror in this sequence as Cristian and July realize that the killer is in the house with them, and armed for an axe. Cristian finds a hiding place for July in the pantry, but it turns out to be not such a good gambit. So Cristian barricades himself in the upstairs bedroom, and waits for the killer to come. And the killer does come.. 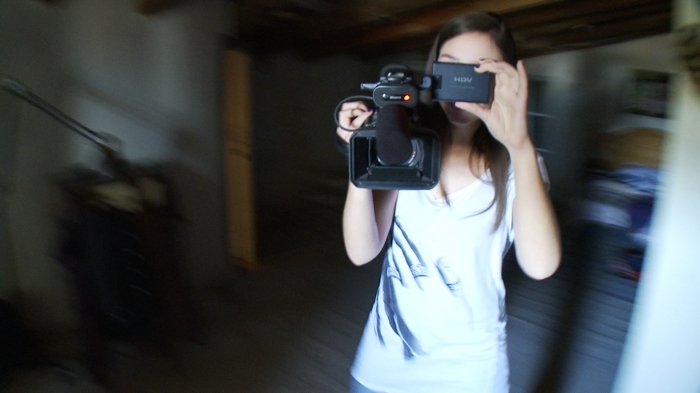 The found-footage format -- for all its deficits in terms of formal style (traditional film grammar) -- can whip up a visual frenzy with its herky-jerky camera-work, dark corners, and immediacy-provoking chase scenes. Atrocious may have a cerebral intent -- to pay homage to the giallo tradition -- but it doesn’t skimp on the visceral thrills one expects of a horror film either. The last act of the film sustains some remarkable tension. In fact, Atrocious may just stay with you for a long while after viewing. I admire the way that the film makes the audience believe it is seeing one kind of story (Paranormal Activity meets the Blair Witch Project) but then, in its final moments, reveals that it led the audience astray. We're actually in an Argento film, or a De Palma film. This is a clever conceit, and such cleverness is often in short supply in films of this type. The word “atrocious” can mean bad or unpleasant, but it can also mean horrifying wickedness. It’s a pleasure to report that Atrocious conforms to the latter definition, not the former. This is one horrifying and wicked found footage movie.